I thought I was an expert in sourcing until I read this book. After all, I managed large-scale strategic sourcing projects for 15 years, ran a niche supply chain consultancy and am a CEO. And yet, I learned so many things when I first read this book that I read it again. While I intuitively knew how to create vested relationships, I had never connected all the dots to meld that concept with sourcing methodology, as well as articulate the subtle differences in the sourcing business models. Companies turn to Procurement to hunker down and lead in shaving costs. But, things have shifted. No longer is Procurement tactical—it is a strategic part of the company that not only has cost-cutting goals, but also has revenue-generating expectations. Who else in a company besides the CEO has the relationships and insights into every line of business? I can answer that in two words…no one. After reading this book, you will be able to empty much of your bookshelf. This is truly the only sourcing book you need. Strategic Sourcing in the New Economy so skillfully references the application of the process to the various business situations you will encounter and offers such great tools you can download and use right away, that you will want to make this required reading for all your staff. 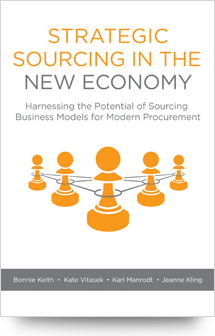 This book provides you with everything you need to demonstrate the complex strategic advantage that sourcing can bring to your company. Endorsed by over 35 top executives and academics worldwide!